China says ready to defend its interests in US trade spat - Integration Through Media ....! BEIJING: The United States has flouted trade rules with an inquiry into intellectual property and China will defend its interests, Vice Premier Liu He told U.S. Treasury Secretary Steven Mnuchin in a telephone call on Saturday, Chinese state media reported. The escalating tension sent shivers through financial markets as investors foresaw dire consequences for the global economy if trade barriers start going up. 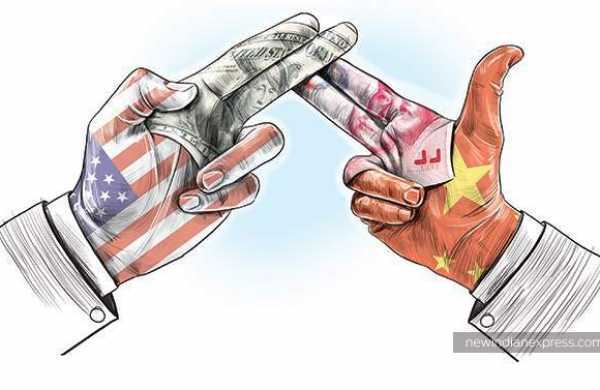 In the call with Mnuchin, Liu, a Harvard-trained economist, said China still hoped both sides would remain “rational” and jointly work together to keep trade relations stable, the official Xinhua news agency reported. Washington is concerned at what it says is the misappropriation of intellectual property following an eight-month investigation under Section 301 of the 1974 U.S. Trade Act. It has also pressed China to cut its staggering $375 billion trade surplus with the United States by $100 billion. Liu said the Section 301 investigation report “violates international trade rules and is beneficial to neither Chinese interests, U.S. interests nor global interests”, Xinhua cited him as saying. “China has already prepared, and has the strength, to defend its national interests,” Liu said, adding that China hopes both sides can work hard to protect generally stable Sino-U.S. trade and business relations. Both sides agreed to continue to communicate on the matter, the report added, without providing further details. China has showed its readiness to retaliate, declaring on Friday plans to levy additional duties on up to $3 billion of U.S. imports, including fruit and wine. The measures were in response to U.S. import tariffs on steel and aluminium that were due to take effect on Friday, imposed after a separate U.S. probe. China's state-run Global Times said Beijing was only just beginning to look at means to retaliate. “We believe it is only part of China's countermeasures, and soybeans and other U.S. farm products will be targeted,” the widely-read tabloid said in a Saturday editorial. The ruling Communist Party's official People's Daily said in a commentary that Washington was determined to choose “rashness and impetuousness” despite China's efforts to be constructive. The United States should not underestimate China's determination to protect itself, the paper said in an article signed “Zhong Sheng”, or “Voice of China”, used to express its views on foreign affairs. A former Chinese finance minister told the annual China Development Forum in Beijing on Saturday that the commerce ministry's response so far had been relatively weak. “If I were in the government, I would probably hit soybeans first, then hit autos and airplanes,” said the respected Lou Jiwei, currently chairman of the National Council for Social Security Fund (NCSSF). U.S. farm groups have long feared that China, which imports more than third of all U.S. soybeans, could slow their purchases of agricultural products, heaping more pain on the struggling U.S. farm sector. U.S. agricultural exports to China stood at $19.6 billion last year, with soybean shipments accounting for $12.4 billion. Chinese penalties on U.S. soybeans will especially hurt Iowa, a state that backed Trump in the 2016 presidential elections and is home to U.S. Ambassador to China Terry Branstad. Boeing jets have also been often cited as a potential target by China. Several Western chief executives attending the high-profile forum in Beijing urged restraint amid the growing trade spat. Both countries had benefitted by globalisation, Blackrock Inc's CEO Larry Fink said at the forum. Tim Cook, chief executive of Apple Inc, called for “calm heads” amid the dispute. The sparring between China and the U.S. has cast a spotlight on hardware makers such as Apple, which assemble the majority of their products in China for export to other countries. Electrical goods and tech are the largest U.S. import item from China.